Description: Looks like a meet, I love these times of "train hunting" ~ UP Mt. Vernon Sub. Description: Check it out, he is looking to make sure he has all his train still, he hopes anyhow ~ UP Mt. Vernon Sub. Description: Northbound UP takes the siding at Mt. Vernon ~ UP Mt. Vernon Sub. Description: Northbound UP takes the siding as a UP Z-train waits on the main ~ UP Mt. Vernon Sub. Description: Ferromex unit in consist! Description: Q351 westbound at Amsterdam. 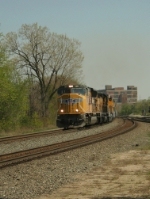 Title: WB UP 3881 near Maud, Il.. Description: As the westbound nears, UP 5256 begins to pull, with two DPUs bringing up the rear. Description: Maple Ave, 0810 hours. Description: Union Pacific SD70M 3881 going through the lake on the Third Track. Description: NS HC42 with Union Pacific SD70M 3881. Description: NS HC42 turning a Union Pacific SD70M on the Croxton Wye. 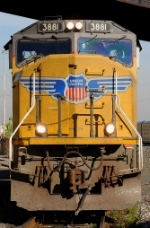 Description: The face of the Union Pacific SD70M 3881. Description: The nose logo on this Union Pacific SD70M at Norfolk Southern's Croxton Yard.